Source: Via 18th Battalion Facebook Group post by Andrew Taylor including attached news article. Image from the Folkestone Herald, May 15, 1915 regarding this soldier. Source: Andrew Taylor via the 18th Battalion Facebook Group. Pte. 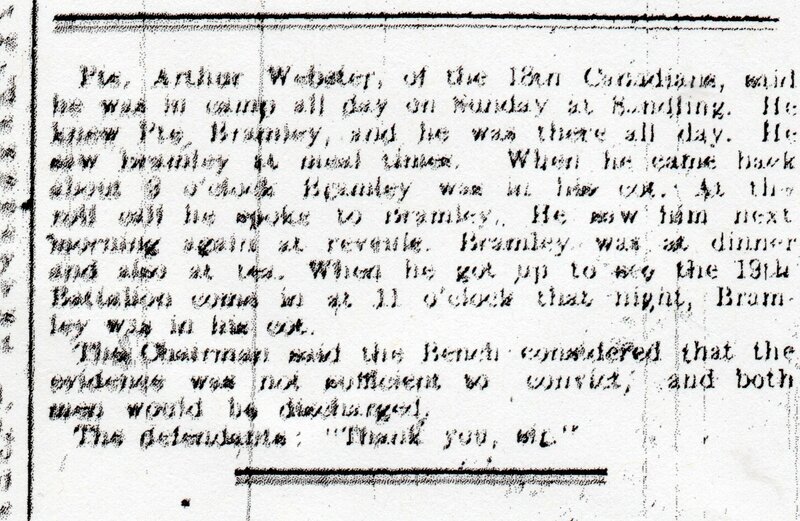 Arthur Webster, of the 18th Canadians, said he was in camp all day on Sunday at Sandling. He knew Pte. Bramley, and he was there all day. He saw Bramley at [several times]. When he came back about 3 o’clock Brankey was in his cot. At the roll call he spoke to Bramley. He saw him at dinner and also at tea. When he got up to see the 19th Battalion come in at 11 o’clock that night, Bramely was in his cot. The Chairman sad the Bench considered that the evidence was not sufficient to convict, and both men would be discharged. Source: Folkestone Herald. May 15, 1915. Service record excerpts. Private Bramley had some issues with discipline.